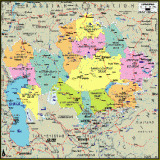 Click here to listen to some Kazakhstan Radio Stations available online. Kazakhstan radio history can be divided into two eras: before and after 1991. Kazakhstan, like any other former Soviet republic, was under one centralised control - Moscow. All USSR republics had only one state radio and television system untill the fall of the country. All union countries had their own Radio and TV, however, they were still under the iron control of the main Soviet Union sytem. 1991 changed all. Since Kazakhstan, and other countries of the USSR have gained their own independence, commercial TV Channels and Radio Stations appeared like "mushrooms". However, some of them survived harsh competition, while others failed under various conditions. Here is the list of some Kazakhstan radio stations that you can listen online. Click on the link to listen to the online version of the Radio stations in kazakh and russian languages in alaphabetical order.